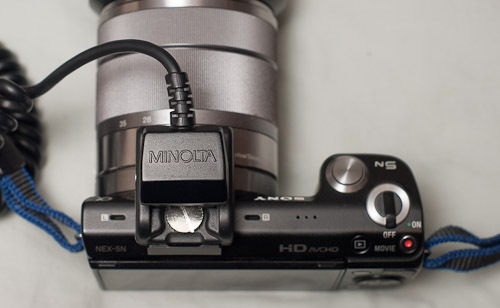 Sanex Hot-Shoe adapter: give your Sony NEX 5n a hot-shoe! Sanex Hot-Shoe in place on the NEX 5n. Now we’re ready for off-camera flash! This time around, we’ll be looking at the Fotasy Sanex hot-shoe adapter for the Sony NEX-5n and other NEX models which Sony “forgot” to equip with a provision for a hot-shoe. If you missed my last post, I became interested in Kristen Dowling’s high ISO flash technique. I wanted to use my NEX 5n as a test vehicle, because it has the best high ISO performance of the various cameras I own. 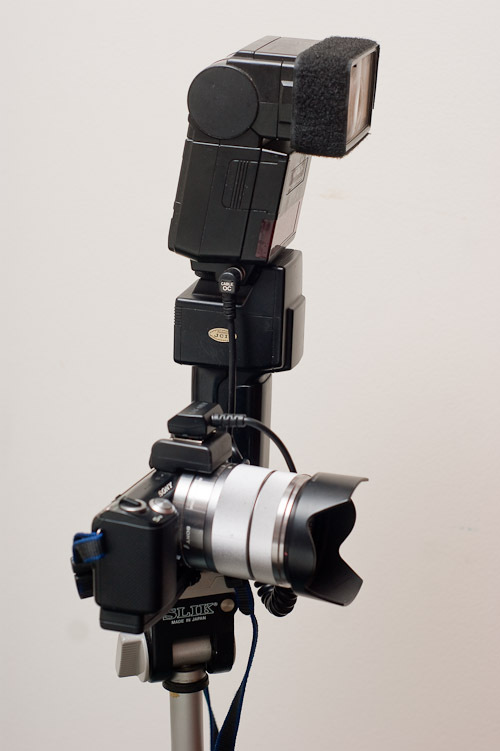 In order to shoot with off camera flash, I needed an add-on hot shoe that would fit the NEX 5n accessory port. 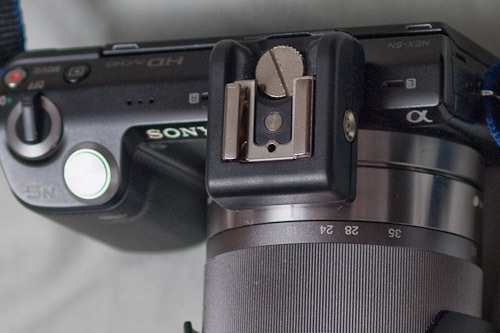 I soon discovered there were a raft of third-party hot-shoe adapters for the NEX series. All I had to do was pick one. With so many different hot-shoes to choose from, I combed through the reviews expecting to find an adapter with a favorable rating. To my initial surprise, all of the aftermarket hot shoes I looked at had inconclusive reviews. I didn’t find any accessory hot-shoes with stand-out positive reviews. For every 5-star, great recommendation, there was a corresponding 1-star result accompanied by warnings that the item was a piece of junk. There didn’t seem to be much middle ground. People either loved these adapters or they hated them. 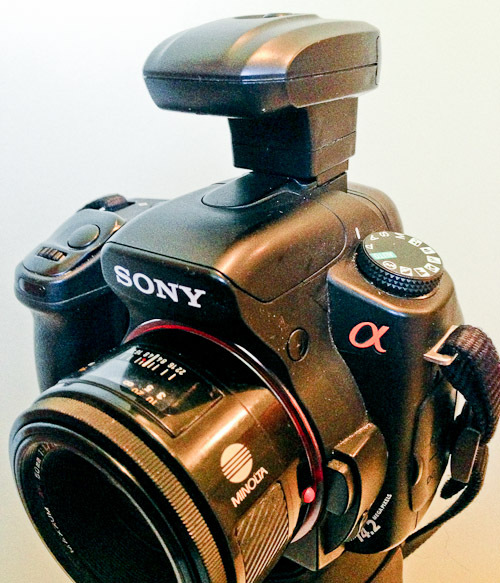 If you want to do proper flash photography with a Sony NEX 5 or NEX 3, you will need a hot shoe adapter that attaches to the camera’s accessory port. I chose this particular adapter because it offers a sync cable port. Notice the port on the side of the adapter. Even more troubling, most of the negative reviews indicated the shoes didn’t work or didn’t fit their camera. Was the quality control on these add-on hot-shoes so bad that half of them wouldn’t even fit on the camera? Why so many poor reviews? A glimmer of understanding came when I noticed a review by user who complained that the hot-shoe adapter wouldn’t fit his NEX-7. The NEX-7 was the first NEX model to be offered with a built-in hot shoe. The NEX-7 also features a built-in eye-level view finder. As a result, there is no room (and no need) for the accessory port offered on the NEX-5 and NEX-3 models. So what possible reason would this NEX-7 owner want to use one of these adapters on his camera, when he already had a perfectly good, built-in hot-shoe? I can only assume that this user (and many of those who complained the shoe did not fit their camera) where actually looking for an adapter that would allow them to attach a slide-in flash on their NEX-7 cameras. The NEX-7 was one of the last Sony models to be equipped with the old Minolta Multi-Interface, click and lock shoe. I have always insisted this was a much better hot-shoe design, but Sony has bowed to demand and reverted to the less-secure, but much more compatible ISO slide-in style shoe. I suspect that most of the people who claimed these shoes did not fit their cameras were NEX-7 owners looking to adapt slide in flash units to the built in hot-shoe. There are a plethora of such adapters available (including some manufactured by Sony,) but they are quite different from these add-on shoes, which are designed to add a hot-shoe to NEX cameras without this essential item. 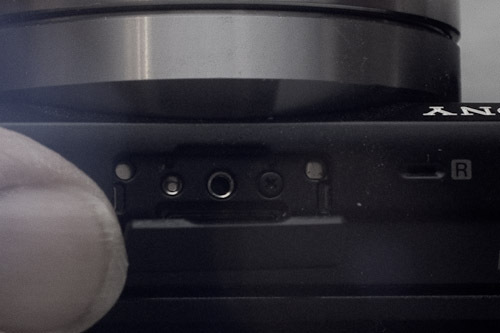 A look under the flap on top of the NEX 5n shows the Sony accessory port used on the NEX 5 and NEX 3 mirrorless cameras. The larger NEX 7 models do not have an accessory port. They are equipped with built-in hot-shoe, so they have no need of an adapter. I also noticed some complaints by users who said their flash wouldn’t fit into the shoe. Once again I’m guessing, but I believe that these users own Sony flash units designed for their older Alpha dSLRs, and wanted to use their Multi-Interface flashes with their newly acquired NEX camera. Since all of the add-on-shoes I looked at had the slide in style socket, there is no way to connect older Sony flashes to these shoes, without adding an adapter. Once I established that the hot-shoe complaints were probably based on a misunderstanding of the NEX hot-shoe adapter’s intended purpose, I was much more comfortable picking one out. I surfed through dozens of listings on Amazon. I’m not sure that any of the adapters were necessary better than any other. Most of them are similar in price, and the construction appears to be basically the same as well. In the end, I chose the Fotasy Sanex. I selected this model because it included a PC sync port on the side. I may never use the port, but I figured it was worth having in case I ever wanted to hook some old-style studio strobes to the NEX 5n. Sanex also sells a smaller, low-profile adapter that doesn’t stick up as far above the top of the camera. The low-profile shoe has a nicer appearance, but doesn’t include the sync port. In the end, I chose the larger model. The Sanex add-on shoe arrived in a nice cardboard box. Inside the box, I found the unit ensconced a dense foam insert. The insert had a precision cut out designed to exactly fit the hot-shoe. This doesn’t any effect on how well the shoe functions, but it is nice Fotasy took the trouble to create a nice first impression. Most of the stuff I get from Asia is just stuffed in a padded bag, or is enclosed in a cheap plastic wrapper. The Fotasy Sanex packaging was first-rate. Underneath the hot-shoe, I found a microfiber lens cleaning cloth that Sanex included as a bonus. I would not have bought this unit just because of the cloth and the packaging. Still, the extra details are nice features. Adding the adapter gave me an actual hot-shoe on my NEX-5n. It works very well. I’ll talk more about how it functions in another post, but now I need to point out a couple of limitations to the hot-shoe adapter. In the first place, I have no intention of using an actual flash unit with this adapter. I’ll repeat the advise i have issued many times in the past: the last place you want a flash is on top of the camera, directly above the lens and on the same lens axis. I know, most camera manufacturers place their hot-shoe in this location. Call it tradition or laziness on the part of camera makers. The truth is that this is the worst place to mount a flash: it increases the chance of red-eye, it causes harsh shadows behind your subject and tends to wash-out and flatten the face of your subject. So the idea of placing a flash on top of my NEX-5n never entered my mind. Because there is no flash sync port on the NEX-5n, I will be using the hot-shoe adapter as a way to power an off-camera sync cord. I’ll discuss that more in the next post. for now, however, I want to explore a few limitations of these adapters. The accessory port on the NEX-5n is designed to accept several accessories. You can add a eye-level, electronic viewfinder, a high quality microphone, a proprietary Sony flash unit or one of the many add-on hot shoes. The key is you can only add one item from the above list. You cannot mix and match. 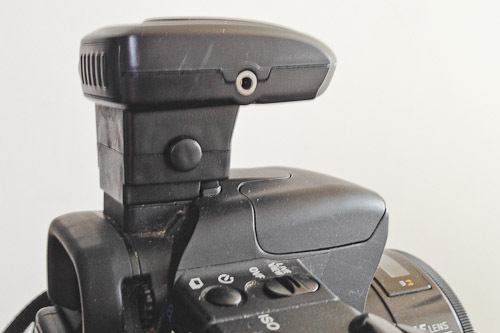 Thus if you attach the EVF, you cannot use a flash — not even the Sony toy flash. If you elect to use a flash or a hot shoe, there is no way to use the Sony FDA EV1S Electronic Viewfinder. I can understand why Sony was reluctant to add a hot shoe to the top of the EVF. You know that some users would attach a huge, heavy flash on top of the EVF. This could have resulted in damage to the EVF or even the camera itself. Still, it would have been nice it Sony sold an EVF with some sort of PC Sync connection. Then NEX users could use the optional EVF with an off-camera flash or a radio trigger. Of course, Sony may not have had this option, The EVF and the hot shoe may share some internal connections, precluding both of them being used at the same time. Still, it would have nice if Sony had found away around this issue. One other small problem with the add-on shoe. there is no provision for TTL (Through The Lens metering) flash. This doesn’t bother me, because I shoot with manual flash almost exclusively. There are some well-known photographers, such as Joe McNally and Rick Sammon, who prefer TTL flash, but there are many others including the Strobist himself, David Hobby, who prefer to shoot with manual flash. If you opt for one of these add-on hot shoes you’ll have to shoot manual, because I didn’t find any that include TTL connections. Again, for myself this isn’t an issue, but if manual flash scares you, this setup isn’t for you. 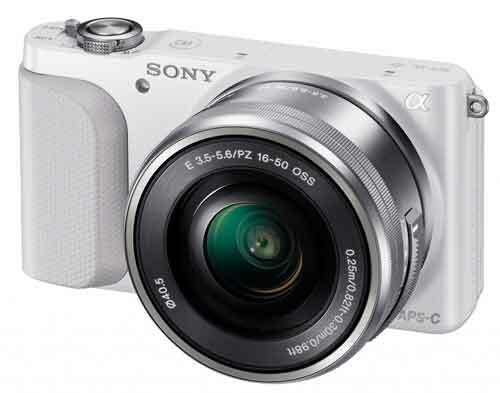 You will need a screwdriver to attach the Sanex hot-shoe to the Sony NEX cameras. As far as I know, all of the third-party hot-shoe use a similar attachment system. These accessory port hot-shoes attach to the camera with a screw, which requires a screw driver to attach and detach them from the camera. The small auxiliary flash Sony shipped with the NEX-5n has uses a thumbscrew to attach to the camera, so you can add and remove it with just your fingers. All of the hot shoe adapters I examined use a slotted screw, which means you’ll need a tool to attach and detach them. 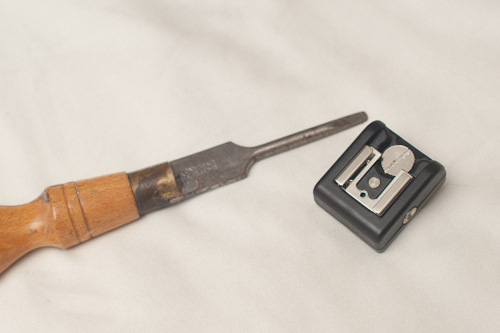 Some accessory shoes include a tiny screwdriver, but I have heard that these Lilliputian tools are ineffective to tighten the hot shoe to the NEX accessory port. I used a real, honest to gosh screwdriver and I have had no problem with the Sanex shoe coming loose. I now carry a screwdriver in my camera bag and I don’t expect to rapidly change between the hot shoe and some other item mounted on the accessory port. Hopefully, the following table should alleviate situations where people buy one of these adapters and find it won’t fit their camera. The bottom line is that these adapters should fit any Sony NEX model that has an accessory port. That includes most of the NEX models that lack a hot-shoe. 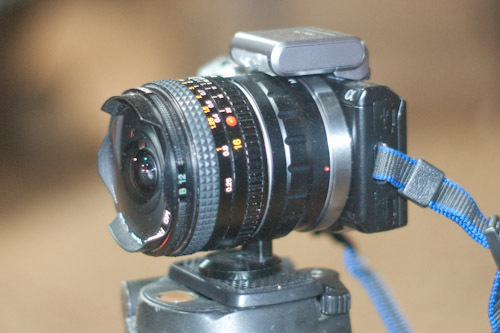 If your camera has a build in hot-shoe, you don’t need one of these adapters. If you have the A5100 or the NEX 3n, both of which lack the accessory port, you cannot use of these adapters. To the best of my knowledge, these adapters will only attach to Sony NEX models with an accessory port. My only experience with this is on the NEX 5n, but it should work on any camera with the accessory port. The models with a hot-shoe have no need of this adapter and the adapter will not fit the models without an accessory port. I advise you to check carefully before purchasing. Now that my NEX 5n has an honest hot-shoe, the next order of business is locating an off-camera cable to connect to my flash. That will be the subject of the next post. NEX-5n ready to shoot with a twenty-five year old Minolta 4000AF flash unit, This combination allows me to shoot with a new technique: high-ISO flash photography. “There is no way to use off-camera flash with the NEX cameras!” That was literally the very first thing that came to my mind when I saw the original NEX mirrorless cameras. There was no sync port and there was no hot-shoe. Sony did include a small auxiliary toy flash unit that could be attached to the camera. But there was no way to trigger off-camera flash. Several years have passed, and Sony has dramatically improved the E-mount line up, dropping the NEX name plate and building in a hot shoe into most of the units. You can obviously use a sync cord or radio trigger with the hot shoe models. But there are millions of E-Mount cameras that lack a hot-shoe. A while back, I added a NEX 5n to my collection, despite that fact that the 5n is a member of the no hot-shoe camp. When I first bought the camera I thought I would investigate ways of adding off-camera flash with the NEX series. But I got busy with other things, so the 5n was regulated to situations that did not require flash. If I wanted to do some serious off-camera flash work, I fell back on my A-mount Alpha dSLRs. Recently, I stumbled across an article by Kristian Dowling entitled What Photographers are NOT Considering When Using High ISO on the PetaPixel Website. To be honest, I thought the article was difficult to follow. After reading it through a few times, however, I became quite interested by the technique advocated by Ms. Dowling. Basically, Dowling suggests using high ISO when shooting with electronic flash. Old Minolta sync cable attached to an aftermarket Sanex hotshoe adapter, which allows me to shoot off camera flash with the NEX 5n. Generally, photographers have always tried to shoot at the lowest ISO to provide clean, noise-free images. Most of us use flash as a way to shoolt in dim light without cranking up the ISO. Dowling, however, goes against the grain (no pun intended) by suggesting photographers use high ISO along with Flash, She points out that with a high ISO, you can stop down the lens for more depth of field and use a faster shutter speed to reduce camera shake. More importantly, she demonstrates that a high ISO setting allows you to shoot at camera’s maximum flash sync speed, which has a number of excellent benefits. I have shot a telephoto lens and a flash unit numerous times. In the past, my technique was to open the lens to it’s maximum aperture and adjust the shutter speed to the lowest speed I could get away with. This produced acceptable results, although there were many shots I had to discard because the subject moved or I rocked slightly during the exposure, Maximum aperture produces razor-thin depth of field, meaning it is all to easy to introduce softness into the subject. Dowling points out that raising the ISO allows you to stop the lens down, gaining greater depth of field, increasing your chance of getting a sharp image. In addition, it allows you to increase the shutter speed, which decreases the chance that subject movement or camera shake will blur the image. Of course, higher ISO does introduce greater noise. But Sony and other sensor manufactures have made great strides in this area, creating sensors that can capture clean images at much higher ISO levels then in the past. The NEX 5n is my best high ISO camera, allowing me to shoot noise-free images at much higher ISO levels than my older dSLRs. It doesn’t compare to the incredible Sony A7s, but then no other camera in the world does. In the All About the Gear Podcast, Doug Kay says he routinely shoots at 3200 ISO with the A7s, and claims the images look as good as ISO 200 from other cameras. The NEX 5n is not in the league of the A7s, but I get very clean images at ISO 1600, and noise reduction software produces very good images at ISO 3200. You might be wondering why you would need a flash at these ISO settings. High ISO can allow you to shoot in very dim light, but flash can eliminate shadows and even out the dynamic range in a photo. Many photographers use fill-in flash in bright daylight, a technique that has been around for decades. Dowling has adapted fill-in flash to shooting with long lenses in low light. It is the same concept as fill-flash in bright sunlight. She is just raising the ISO so the ambient light is very strong and then using low-power fill-flash to eliminate shadows on the subject. I was immediately intrigued by Dowling’s approach, but my older dSLR’s were not capable of shooting very high ISO without creating noise. But I did own a camera that could capture high ISO without introducing noise. My NEX 5n was excellent in this area. But out of the box, it couldn’t shoot off camera flash. It was time to fix that. I made a quick list of what I would need. I already had several Minolta 4000 AF flash units that feature full manual control. I have used them for years with my Sony Alpha dSLRs. 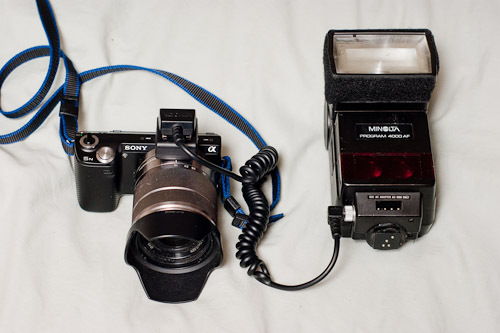 To use one of these with the NEX 5n I would require a hot shoe adapter and a new sync cord. I’ll discuss that next time. 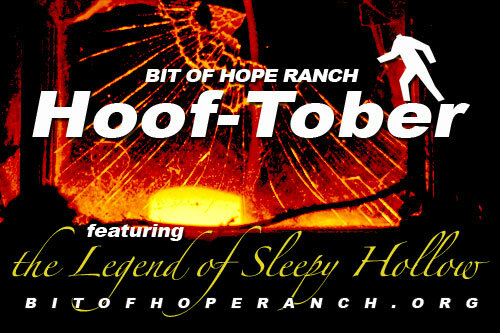 I just completed shooting the Hooftober event at Bit of Hope Ranch. This was a complex event, in part because I was asked to shoot both stills and video. 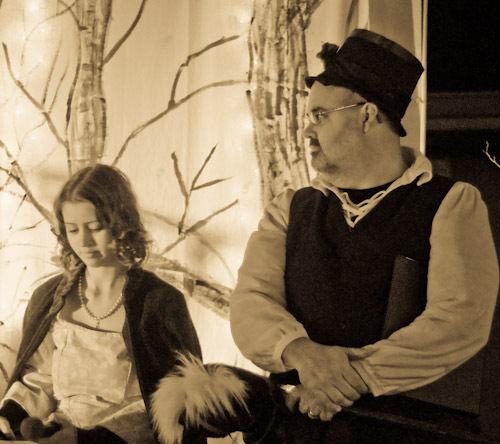 It also required shooting a reader’s theater on stage, as well as numerous spooky attractions along the miles of trails at the ranch. 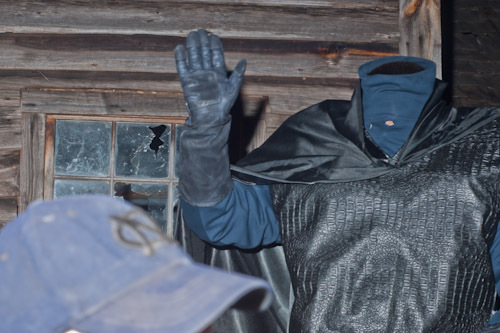 Because the theme was the Legend of Sleepy Hollow, almost everything needed to be shot in the dark. Bit of Hope Ranch is a horse therapy organization which is aimed at helping “at risk” children and teens. The ranch’s mission statement is “Reach, Rescue and Restore broken children, families and horses through programs that build mind, body and spirit.” As the statement implies, in addition to helping children, the ranch’s volunteers are heavily involved in rescuing abused and neglected animals. The non-profit organization, which is located in Gaston County, is celebrating it’s fifth year of operation. How is this for 6400 ISO? I shot this from a moving hay wagon. The figures in the foreground are somewhat blurred due to the movement of the wagon at a slow shutter speed. But the barn and arena in the background are sharp and clear. 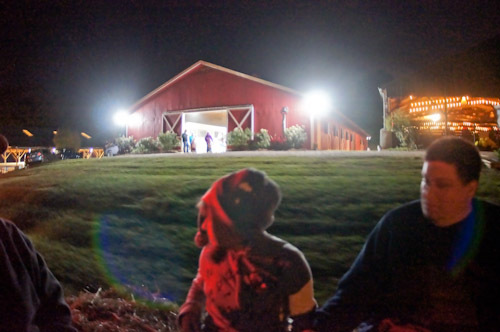 A nice atmospheric shot summing up what it was like to be at Hooftober. Sony NEX 5N, Rokkor 16mm f/2.8. F/2.8 at 1/13 second, ISO of 6400. As I was tasked with capturing both video and still images, I used multiple cameras. Most of the stills were shot with my trusty Sony A350. I used a flash and bracket to capture some of the images, but to enhance the spooky nature of the event, I used a monopod, which allowed me to grab some interesting time exposures. My primary video recording rig was a Sony NEX 5N. Because the NEX 5N has better high ISO performance than the A350, I also used the mirrorless camera for some still images. One of the drawbacks to the 5N i that it lacks a eye-level viewfinder. In this case, with almost all of all of the shooting happening after dark, there was no problem focusing and composing on the NEX-5N’s big LCD screen. Because I was shooting video and long exposures, the NEX-5N spent the entire event bolted to a tripod. I also brought along the Zoom H1 audio recorder, which allowed me to capture audio to be used in videos and slide shows. Of course, in any assignment of this nature, it is crucial to have back up items. In my case, a back up flash unit proved crucial, as my main flash developed a problem and was unusable. Without a backup, I would have been in trouble. I also needed a number of memory cards and extra batteries. The NEX 5N can use either SD cards or Sony Memory Sticks. I filled up my SD Memory and had to rely on a old Memory Stick from the past. Thankfully, it worked well and gave me an extra 4GB of storage for video files. Fast Glass: This is a no brainer. You don’t want to be shooting after dark with a slow lens. I used my 50mm f/1.7 on the A350 (A mount). This proved fast enough for most of the shots, although I could have used something even faster along the trail. For the NEX 5N, I started out with the 18-55mm “kit lens” which has a variable maximum aperture of f/3.5-f/5.6. I replaced that lens with my old Rokkor 16mm f/2.8, mated to a inexpensive MA adapter I purchased off eBay. This combination had two advantages. First the maximum aperture was nearly 1 stop faster at 2.8. Secondly, the 16mm focal lens provided really great depth of field, eliminating the need to manually focus in the dark. I just kept the focus ring at infinity and trusted depth of field to keep everything in focus. Tripod: I already mentioned I used a tripod and monopod to let me shoot long exposures without introducing camera movement. The tripod also can be used as a impromptu stabilizer. I simply clamped the tripod between my arm and my side. It was not as steady as a true stabilizer, of course, but I got some nice, steady digital footage with this technique. Monopod: A monopod is faster to setup and more flexible to use than a tripod. There are times when a tripod is a better option, but for shooting quickly and steadily, the monopod can’t be beat. Limited use of Flash: I had flash units for both cameras, but I tried to avoid flash as much as possible. I’ve talked about shooting Halloween photos with flash before. Flash can turn a spooky, erie scene into just another snapshot. Flash can be great for portraits, sports, corporate events and normal parties, but for Halloween shots, less is definitely more. Of course there were situations where flash was mandatory, because in the woods, there was simply no light available. Whenever possible, however I kept the flash shut off. High ISO: To minimize flash when shooting in dim light, you have to use a high ISO, even with fast lenses. Ordinarily, I prefer to keep the ISO as low as possible, but shooting monsters and goblins in a dark wooded area calls for desperate measures. I pushed the Alpha A350 up to 800 ISO when in the woods. This is about as high as I am comfortable with this camera. Any higher and the noise becomes unacceptable. The NEX 5N offers much better high ISO performance, so I shot at 1600, 3200 and even at 6400 at times. Yes, there will be some noise at these settings, but considering the subject matter I think the noise is satisfactory. I shot some stills with the 5N, because I was comfortable with the high ISO performance. The ISO was even more critical for my video work, since I was working without a video light. In very dim light, the image in the view finder often looked great, but as soon as I pressed the video button, the image would turn dark and muddy. That was my cue to push up the ISO for video, as the camera could capture stills at a lower ISO than video. It was dark on the trails at Bit of Hope, so dark that when the guest of honor showed up, I could see nothing at all through the viewfinder. All I could do was to aim my Sony A350 in the general direction of the apparition and hope. I obviously missed his left arm in this photo (headless and armless), but fortunately the focus is dead on and the old abandoned cabin in the background adds an appropriate mount of creepiness. Ordinarily I strive to eliminate shadows cast by my subjects, but in this case, I think the shadow of the figure’s hand actually enhances the image. Shot with a Minolta 50mm f/1.7 lens and a Minolta 4000AF flash at 50% power. The exposure was f/8 at 1/80 second with an ISO of 200. One of the things I learned in this type of shooting is to travel light. I am not referring to the weight of my camera equipment. I have found it is all too easy to lose things while you are flaiing around in the dark woods at night. To that end, I take only essential items and leave any unnecessary stuff behind. No Lens Caps: I usually use lens caps when I am not shooting, and I am usually never seen without a lens hood. In dense darkness, however, a lens hood isn’t really helpful and lens caps are easily dislodged by branches and vines in the dark. I probably walked several miles tracing the route through the trails. I am happy to say I did not lose anything; in part because I jettisoned everything I did not need before setting out. Don’t forget a Flashlight: My big Maglite proved to be as important as my camera equipment. It would be all to easy to blunder off the trail and get lost in the woods. In addition, I used the Maglite’s beam to paint light on some of my subjects. This was particularly effective with video work, as you can see the beam moving through the darkness, suddenly bringing something hidden in to view. No camera bag: In the spirit of traveling light, I left my camera bag in my truck. I didn’t want the bag and belts catching on limbs and branches. It also would take up space on the hay wagon, so I left it behind. I had no intention of changing lenses along the trail, so I carried the NEX 5N on it’s tripod, and used the A350 with a monopod. The second night, I left the monopod home and used the A350 with a 4000AF flash ands bracket. A place for everything: With no camera bag, I needed to be sure I was prepared. I stuffed extra batteries for camera and flash in my pockets. I strapped my Case Logic memory card holder to my belt, ensuring I had extra memory, as well as place to safely store cards I had filled with images. Another advantage to hauling the Maglight on the trail; I had light to change cards and batteries. Finally, the Zoom H1 recorder is small enough to fit in another pocket. Keeping track of memory cards: It is always important to take care of your memory cards, but this situation made the task more difficult. Working in dense darkness, juggling Compact Flash cards for the Sony A350, along with SD and Memory Sticks for the NEX 5N, I needed to take extra care to properly manage my memory cards. I ensured that I stored my filled cards in a different place than my blank memory. Characters in costume are always fun to shoot, an the Hooftober event at Bit of Hope offered lots of interesting photo opportunities. 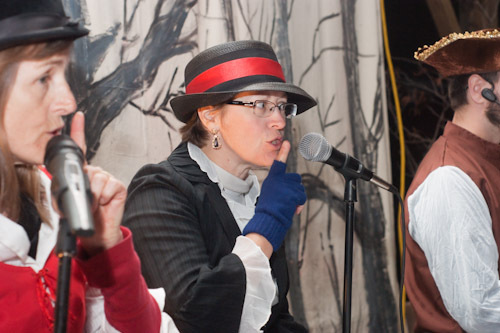 I like the narrater’s pose this shot; you know she is saying “shish….” even without audio. The theater was in Bit of Hope’s covered arena. I bonuced my Minolta 4000AF flash off the arena’s metal roof to light the characters without nasty shadow behind them. Sony A350, Minolta 50mm f/1.7 lens, f/5 at 1/80th second, ISO 800. Noise reduction applied in Adobe Lightroom. The same concern for memory cards applies to uploading everything to my computer. The following day I made sure everything was safely uploaded and backed up. 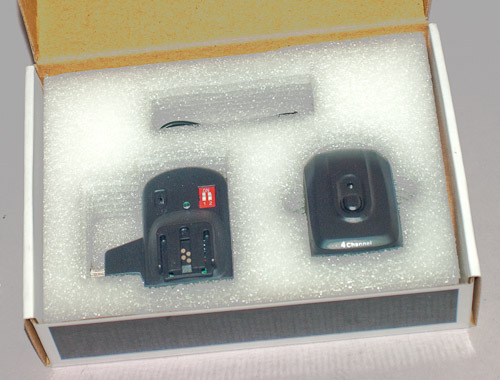 This involved uploading Compact Flash, SD Cards, Memory Sticks and a micro SD memory card from the Zoom H1 recorder. I was careful to organize my stills, video and audio where I could find everything. Some of the files had the same file name, which presents the danger of one file overwriting another. I was careful to download each card to it’s own folder, eliminating the risk of overwriting another file. The final step is to prepare everything for the next shoot. You may may not be shooting in the deep woods, but my experiences at Hooftober can apply to any Halloween party — or even simply shooting the trick and treaters that appear at your front door. Two more characters at Bit of Hope’s reader’s theater. I used a monopod to hold the camera steady for this available light image. Sony A350, Minolta 50mm f/1.7, 1/8 second, f/1.7, ISO 800. Processed in Adobe Lightroom. Noise reduction and Antique Light preset were applied then custom adjustments were made to tweak the tones of the skin and clothing. No flash was used for this image. 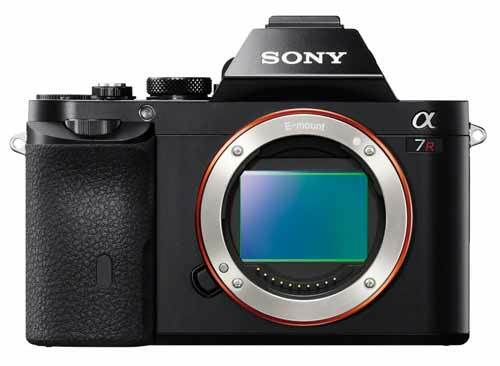 The Alpha A7 is one of two full-frame mirrorless cameras Sony will be introducing this December. The 24mp, 35mm sensor size camera will be available witht a new full-frame 28-70mm E-mount . 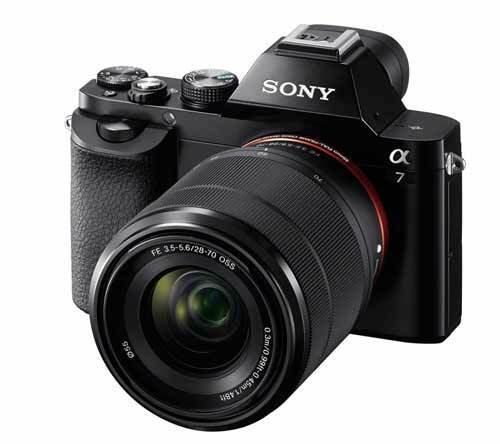 If there was any doubt that Sony is the most innovative camera maker, the newly announced Alpha A7 and Alpha A7R prove that the Sony camera engineers are at the top of their game. To no one’s great surprise, Sony has announced two full-frame, E-Mount cameras. Until now, all of Sony’s E-mount cameras relied on APS-C size sensors. The new Alpha A7 will feature a 24.3 megapixel, Exmor® CMOS full-frame sensor and sell for $1700 (body only.) You can order the A7 with the brand-new 28-70mm F3.5 – F5.6 full-frame lens for about $2000. These new cameras are intriguing in many ways. In the first place, although the new cameras carry the same E-mount which was first introduced with the original Sony NEX mirrorless offerings, Sony has dropped the NEX designation for these cameras. Secondly, with 36mp, the A7R carries more pixels than Sony’s flagship Alpha A99. With a built-in electronic view finder, HD video, fast auto focus, built-in WiFi and magnesium weather sealed body, there is little that the A99 can offer that can’t be done with the A7R. About the only advantage the A99 can boast is native compatibility with Sony and Minolta A-mount lenses. 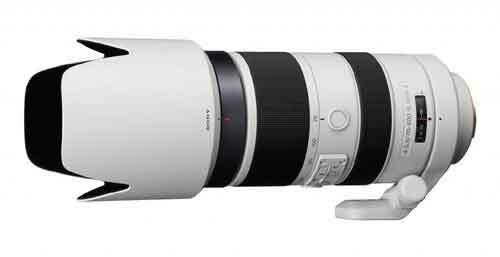 Sony is offering a new full-frame adapters, which will allow users to mount and use A-mount lenses on the A7 and A7R. Is this the death-knell for the A-mount cameras? Or will Sony continue to develop A-mount SLTs? Yes, that is a full-frame 35mm sensor inside the E-mount on the A7R. 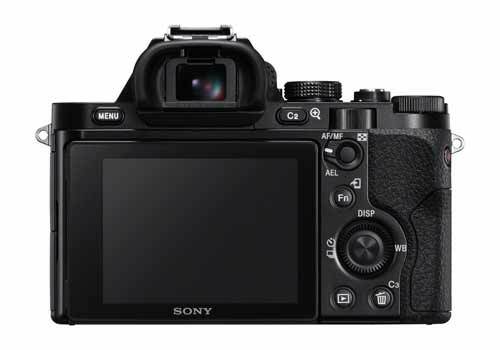 The A7R (shown) carries a mammoth 36mp sensor, the largest sensor in any Sony camera to date. Thirdly, the new cameras require new E-mount lenses which can cover a full-frame sensor. You can use your existing E-mount lenses with the A7 and A7R, but you need to use a crop setting or live with heavy corner vignetting. Just as there are full-frame and crop-frame A-mount lenses, going forward there will be two types of E-mount optics. You can use the full-frame lenses with any E-mount camera, but the original APS-C coverage lenses will crop the image on the full-frame cameras, resulting in a lower pixel count with the older lenses. At the same time, for those who want the smallest camera setup possible, full-frame lenses are usually bigger and heavier than dedicated APS-C coverage lenses. It appears for the foreseeable future, we will see both full-frame and crop sensor lenses in the E-Mount lineup. Currently Sony is offering five new full-frame E-mount lenses in its catalog. I would expect that third party manufacturers will quickly convert some of their full-frame optics into the E-mount to anticipate the desire for new full-frame lenses for the A7 series. Both cameras will feature the aforementioned weather sealed body and both will offer WiFi and NFC connectively. The cameras will be compatible with Sony’s PlayMemoriesTM app store. The A7 series features a generous tilting 3.0 inch LCD and built in electronic view-finder. Both models offer WiFi and NFC and feature magnesium weather sealed bodies. Sony hasn’t forgotten video enthusiasts, and has equipped the A7 series with 1920X1080p AVCHD progressive video at 60fps. Both cameras carry a “live” HDMI connector that can pass video to an external monitor or auxiliary recording device. The A7 and A7R are expected to be in stores by December, just in time for Christmas. The A7 series cameras are true game changers, as the A-mount cameras appear to be stepping aside for new professional level E-mount Alphas. After waiting for Sony to offer a radio wireless flash trigger for the auto lock style hot shoe, I found a Cowboy Studio trigger/receiver set up that works with the auto lock shoe. I’ve been testing a set of Cowboy Studio Wireless Flash triggers on my Sony Alpha with the Minolta/Sony Auto-Lock hot shoe. I am fairly happy with these inexpensive radio triggers, especially since I don’t have to mess with a hot shoe adapter. With the A99, NEX-6, A-58 and other new models, Sony has embraced the new Multi-interface hot-shoe design. This is essentially the same hot-shoe used by other manufacturers, meaning Sony Alpha owners can access numerous third-party accessories if they upgrade to the newest Alpha hardware. Owners of older Sony Alpha designs, however, still have the less compatible auto-lock hot-shoe originally designed by Minolta. In addition to older, discontinued models, many of the current top sellers in the Sony catalog (A-77, NEX-7) still use the auto-lock shoe. I’ve gone on record to say I prefer the auto-lock shoe because I think it is far superior to the slip-on multi-interface shoe. Still, there is no denying that the multi-interface design is much more compatible with third-party accessories. Going forward, Sony users will have many more choices available to them for flashes, radio triggers and other hot shoe accessories. Which still leaves users of older hardware and those purchasing new cameras with the auto-lock shoe at a disadvantage. One of the biggest concerns is using radio triggers with the auto-lock shoe. Look ma, no adapters! The Cowboy Studio Model NPT-04S1 fits the Auto Lock hot-shoe used on older Sony Alpha models and all Minolta dSLRs. Reliability is good, at least at a distance of less than 35 feet. If you’ve been reading this blog for a while, you know I have questioned why Sony hadn’t introduced a Sony Alpha branded radio trigger set. With Sony’s vast experience in the radio communications area, this would seem to be a logical move. Several years later, I and the rest of the Sony Alpha world are still waiting. I considered going with another solution like Pocket Wizards, but this would involve some form of adapter, and really didn’t want to start messing with hot-shoe adapters. It might work fine, but it seemed that the adapter would be just another link in the chain that could cause problems. So I waited, watching while Sony experimented with translucent mirrors, mirrorless cameras and other innovations, but pointedly ignored the need for an Alpha radio flash trigger. A few months ago, I was listing to Frederick Van Johnson’s round table podcast called This Week In Photography. TWIP is way too focused and Nikon and Canon for my taste, but all-in-all it offers an excellent look at current photography trends. The guest list changes weekly, and here have even been a few Sony shooters among them. One of the recent guests was Derrick Story. While I have never met Mr. Story, I have been listening to his own podcast for years, and reading his articles in Macworld for much longer. I was surprised to hear Story recommend Cowboy Studio flash triggers. Everyone knows that cheap, Chinese flash triggers are a waste of money. But Story claimed the inexpensive Cowboy Studio flash triggers worked flawlessly for him. Hmmm. A couple of weeks later, I listened to Story’s own Podcast, The Digital Story. Once again, Story praised the Cowboy Studio units as reliable, affordable and well-made flash triggers. 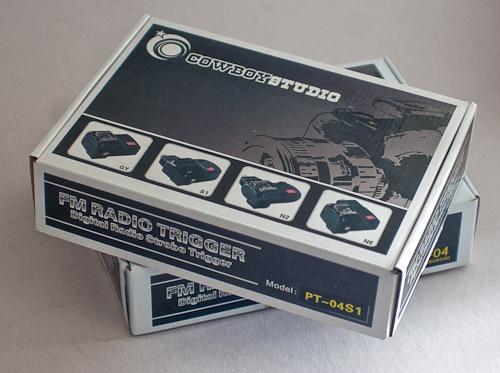 I ordered two sets of Cowboy Studio triggers. 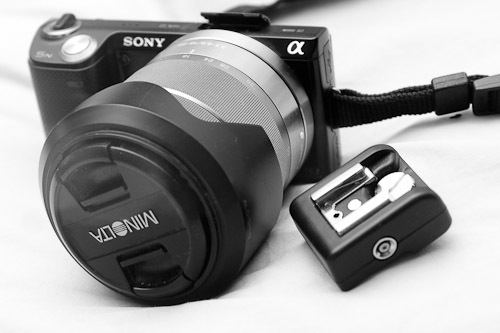 One is designed for the Sony Alpha Auto Lock Hot Shoe. The other fits the more common slip-on Multi Interface shoe. Selling for less that $25 for a set, this seemed like it might be worth checking out. I figured I would still need an adapter, but for less than $25, what did I have to lose? When I checked Amazon for Cowboy Studio units, I was excited to see a model designed for the Sony Alpha auto-lock shoe. No adapter needed. With Story’s recommendation, and the knowledge I wouldn’t need an adapter, I ordered a set. Actually, I ordered two sets. 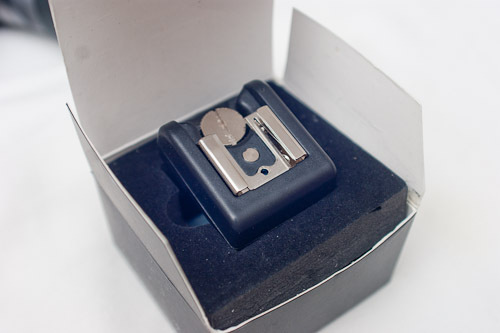 The first is the NPT-04S1, which provides a transmitter for the Sony auto-lock hot shoe and a single receiver that accepts a auto-lock style flash. Because I have a collection of older Minolta 4000AF flashes, which use the common slip-on flash foot, I also ordered the NPT-04 set. This gave me two receivers designed to accept the multi-interface flash foot. It also included a multi-interface trigger, which I have no real use for at this time. But Amazon had a sale going on and I got the NPT-04 set for less than the cost of a single receiver. I’ve tried these triggers on several assignments so far. Overall, I am pleased, but there are a few limitations. My biggest gripe concerns range — or lack of it. According to the specs, the triggers are supposed to have range of 30 meters — roughly 90 feet. I am only seeing about half of that. When the trigger is less than 30 feet from the receiver, everything works fine. At 35 -45 feet, the reception is spotty. The flash only fires part of the time. Beyond 45 feet, forget about it. This isn’t deal-breaker. At 30 feet or less, the Cowboy Studio triggers are perfectly reliable. Receivers run on two AAA batteries. I am using NiMH rechargeable cells. Although I doubt it will make much difference, I intend to test the triggers with different batteries. The trigger came bundled with a A23 cell. Batteries that are supplied with new electronic equipment are notorious for being old and weak, so I intend to replace the included cell with a fresh A23 battery to see if it makes a difference. I may also try other cells in the receivers. 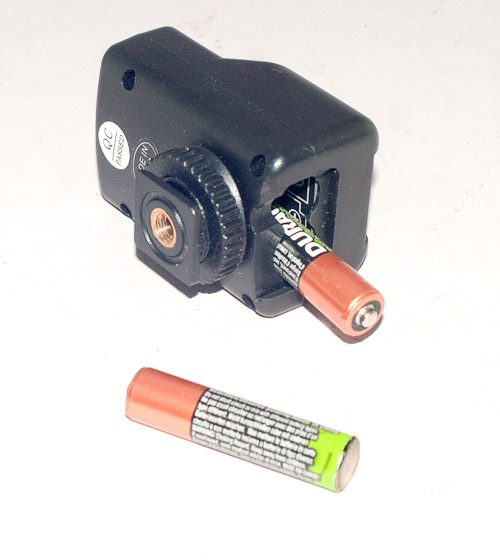 The receiver uses two AAA batteries. I am using 800MA NiMH rechargeable batteries. NiMH cells usually work perfectly a replacement for alkaline batteries, but they only have a voltage of 1.2 instead of the the 1.5 voltage you get with alkaline batteries. I doubt this will make a huge difference, but I will try some alkaline batteries to see if they improve the range. 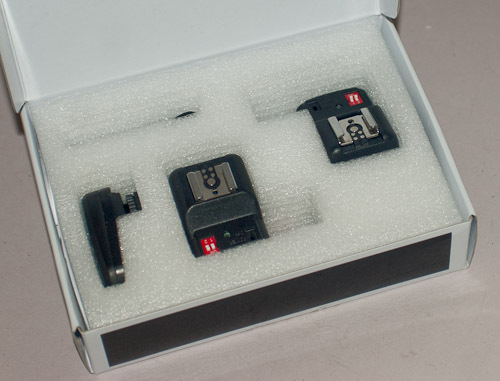 The Auto Lock Shoe Set (PT-04S1) contains one radio transmitter that fits the Sony Alpha auto lock shoe and a matching receiver for Sony style flash units. A second concern is using Sony and Minolta flash units with the system. These flashes are designed to conserve battery life by going dormant when the flash is unused for a time. Used on the hot shoe or with a sync cord, the camera is able to wake the flash from its battery-saving nap. The radio triggers don’t have that ability. If the flash goes dormant, the trigger cannot wake it. You have to physically turn it off and on again. Depending on circumstances, this can be a pain. Besides the nuisance of having to physically turn the flash on and off, it also resets the flash to full power. If I have the flash set to a lower power setting, I have to remember to adjust the level again. It is a little thing, but when you are engrossed in making a series of important shots it is one more detail to remember. I haven’t tried the Cowboy Studio units with my Sony HLV-F42AM flash as yet. I have heard that you need to attach the flash to the camera first, then attach it to the receiver. Otherwise the flash will not be recognized by the receiver/transmitter. If true, this sounds like a real pain. Anytime the flash goes dormant, you would have to mount the flash to the camera to get it working again. Fortunately, the Minolta AF4000 doesn’t require this step, but you do need to turn the flash off and on to wake it when it goes dormant. 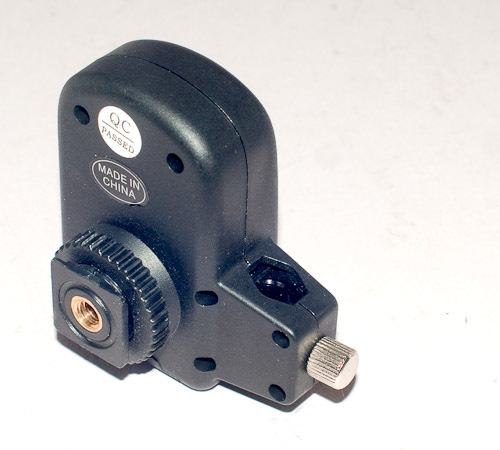 The bottom of the Cowboy Studio auto lock receiver displays the brass tripod socket. The hexagonal opening on the flange on the left is designed to accommodate a standard umbrella mount. Not all of the Cowboy Studio receivers feature an umbrella mount, this is the receiver included in the PT-04S1 kit. The Cowboy Studio triggers do not support TTL flash. I wasn’t too concerned about that, because my main flash is the 4000AF, which doesn’t support TTL flash with the Sony Alpha. I quickly discovered there is a big difference using manual flash from a bracket on the camera, and firing your flash from a distance with a radio trigger. Using the 4000AF with a sync cord at the camera, it is a simple matter to manually adjust power levels to suit the conditions. It only takes a second to adjust the power up or down if my LCD preview indicates the power is too high or too low. When the flash is on a light pole some distance away, however, it is no trivial matter to adjust the flash. You have to leave your position, lower the flash and adjust the power level. If the flash is located in an inaccessible place, you may have no access to the flash until the event is over. In this situation, you have to live with the flash setting, even if the light levels at the scene change. Obviously, TTL flash would be a great option in this situation. I was pleasantly surprised at the build quality of these units. I am accustomed to see poor quality control from inexpensive, off-brand electronics from overseas. That is not the case with the Cowboy studio flash triggers. It is true, the casing are plastic, and might be damaged in hard use. But what do you want for $25.00? The seams in the receiver bodies line up well, the trigger foot clicked into the hot shoe perfectly and all the screws were in place and appeared to be tight. The NPT-04 set will not fit the Auto Lock shoe that the majority of Sony Alpha dSLR and SLT cameras. The transceiver should work with the new Multi Interface shoe that Sony is using on newer cameras such as the A99 and NEX -6. I am using the receivers with my old Minolta 4000AF flash units. many inexpensive photographic accessories attempt to get away with a plastic tripod socket. The metal attachment gives me confidence that the Cowboy Studio components were well engineered. I plan on a more exhaustive test in the near future, I am sure I will have a lot more to say at that time, In the meantime, if you have always wanted to experiment with a radio flash trigger. I join Mr. Story in recommending the Cowboy Studio flashes — especially for Sony Alpha shooters with auto-lock shoes. You can find Cowboy Studio radio flash triggers at Amazon.com. I haven’t tested these on a camera, but the transceiver should work with new Sony Alphas such as the A99, A58 and NEX-6. Should fire any flash with the multi-interface hot shoe. They work well with my twenty year old Minolta 4000AF units. Hasselblad has announced the Lunar, a new APS-C sensor camera, based squarely on the Sony NEX-7. 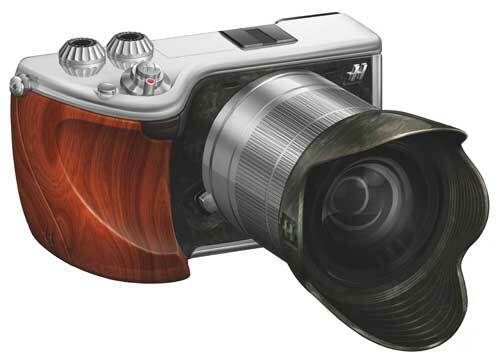 I haven’t seen a published ship date, but Hasselblad has said the new Lunar will ship in the first quarter of 2013. The new camera will be available in a huge array of wood, leather, carbon-fiber and gold finishes, leading many observers to believe the esoteric camera company is choosing style and form over function. Hasselblad, of course denies these allegations, insisting that the new high-end mirrorless camera is worthy of carrying Arvid Viktor Hasselblad’s name. There is a small, but vocal group that will insist that Sony isn’t a “real” camera company. According to their line of thinking, Sony is a big electronic company, which is playing in the photographic field to earn lots of cash. But they really have no experience with true photography. It is all lies, of course. Focus Camera is offering two 16GB Sony Class 10 SDHC Memory Cards for $17.95, including shipping. That will give you 32GB of memory for about $.0.56 per Gigabyte. Need memory? 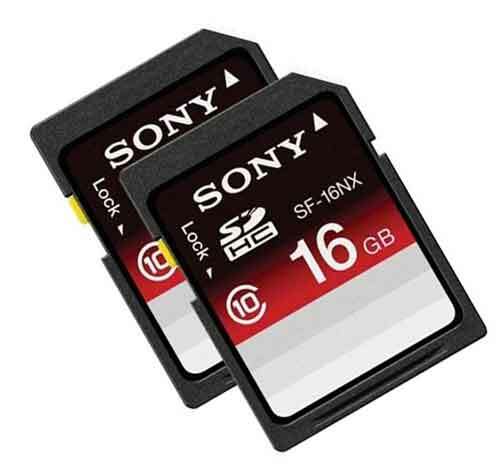 Focus Camera, through Rakuten Shopping, is offering the 16GB Sony SDHC Class 10 two pack for $17.95. With free budget shipping, that is 32GB worth of SD storage: roughly 56 cents per Gig of memory. Sony also chose this week to introduce a new mirrorless model: the new NEX-3N. 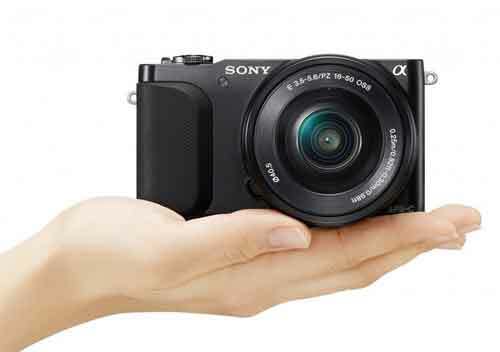 Introduced alongside the Alpha A58, Sony claims the little 16mp camera is the smallest and lightest interchangeable-lens camera with an APS-C size sensor. That might be spitting hairs, but when Sony first introduced the NEX, they were introduced as the worlds’ smallest interchangeable lens digital cameras. Other manufacturers have since offered even smaller cameras, but none of them can boast a true APS-C size sensor. Sony is justified in pointing out that the new little wonder boasts the same size sensor found in most dSLRs. Since all NEX models have APS-C sensors, the new NEX-3N must be even smaller than the original NEX-3, to qualify as the smallest APS interchangable lens camea. 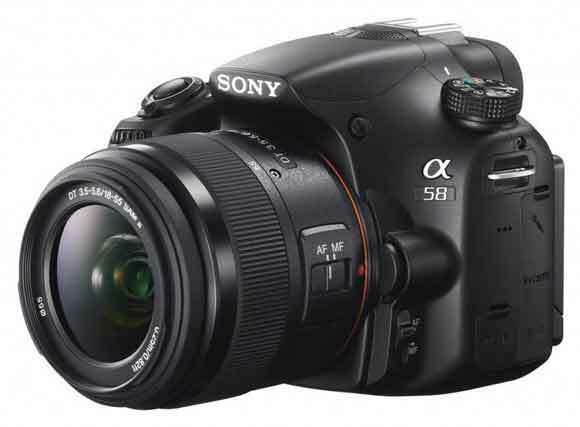 Sony has just announced the Alpha A58, a low-cost, 20 megapixel SLT interchangeable lens camera. The new camera is a wonderful illustration of how far we have come in digital camera development. In 2006, Sony introduced its first dSLR, the venerable Alpha A100. The A100 was a conventional dSLR with a flip-up mirror, based around the 6mp Minolta 5D, the last major camera design from Minolta. The A100 garnered plenty of interest, principly because it was the first commercially available dSLR to offer a 10mp sensor in a camera that sold for under $1000. Fast forward seven years and the photographic landscape is a drastically different place.